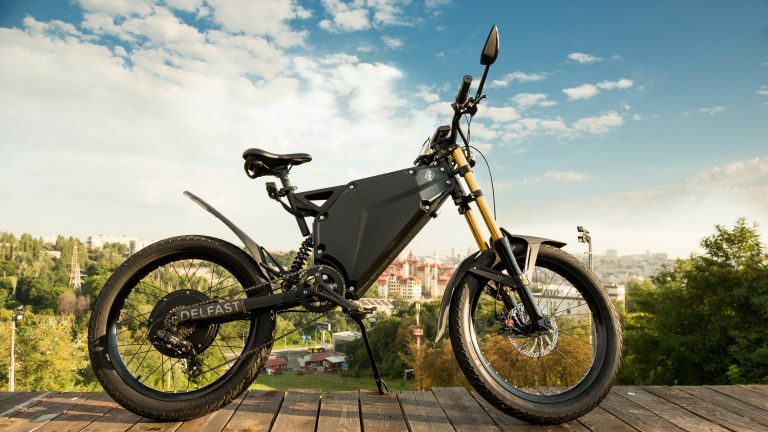 The DelFast e-bike has a 236 mile range, top speed of 35 mph, and plenty of smart features, essentially, what you're looking at here is essentially the Tesla of electric bikes. Let's start off with that range. This bike has been designed for long-distance trips in both urban and rural areas. It packs a US-made 3000-cycle battery with energy recuperating brakes. That'll propel you along for 236 miles, which is a longer range than most electric cars. The battery also features two USB sockets, so you can also charge your smartphone on the commute. Now lets move onto the speed. The DelFast's 'cruise speed' is 25-28 mph, with a maximum speed of 35 mph. If you've been brushing up on your Highway Code, you'll know that's actually illegal on UK roads. To make it road legal, the e-bike features a 15mph limiter which can be easily switched on and off. Alternatively, you could register the bike as a motor vehicle. You can choose to go full electric, or travel in pedal assist mode. As well as being fast and capable, the DelFast bike also features smart features along with a smartphone app. This adds the ability to track your bike using GPS, immobilise it, and select which mode you need. And finally, for your safety, the bike also features turn indicators and a brake lights. “Delfast is a hybrid between a cross-country motorcycle and a mountain bike. With this bike you can ride around the city, off-road and, most importantly, for long distances”, said Daniel Tonkopiy, the company’s CEO. DelFast was launched on Kickstarter on the 20th September with a funding goal of $50,000. The company has already passed its goal. Prices start at $2989 (around £2200).